On 14 May, Belarusian President Alexander Lukashenka and Pakistani Prime Minister Nawaz Sharif met at the One Belt, One Road Forum in Beijing. This became the two leaders’ fourth encounter since May 2015. Indeed, as Sharif said at the meeting, relations between Pakistan and Belarus have been strengthening ‘with every passing day’ over the past two years. ‘The Minsk-Beijing-Islamabad triangle could become a promising formula for cooperation’, Lukashenka stated hopefully in 2015. After many years spent on developing relations with New Delhi, Belarus seems to be placing its bets on India’s geopolitical rivals, China and Pakistan. But will this bet pay off economically, as the Belarusian leader anticipates? Belarus established its diplomatic relations with Pakistan on 3 February 1994. During the first twenty years, the two countries’ contacts remained limited to a handful of encounters at the ministerial level – mostly during the late 1990s. Within the same timeframe, Alexander Lukashenka visited India twice, in 1997 and 2007. Heads of the Belarusian government visited New Delhi in 1993, 2002, and 2012. There were regular meetings between Belarusian and Indian ministers of foreign affairs and defence, heads of other agencies and parliamentary delegations. Minsk signalled its intention to balance its relations with South Asian nations in November 2014, when it opened its embassy in Islamabad (Belarus’s embassy in New Delhi has been up and running since 1998). Over the next two years, Pakistan unmistakably became Belarus’s preferred partner in South Asia. During a recent meeting in Beijing, Lukashenka called Pakistan Belarus’s ‘best friend’. Experts believe that certain conservative Arab regimes (Pakistan’s long-time sponsors) and China, a traditional Pakistani ally, might be behind the suddenly flourishing Belarus-Pakistan ties. The Belarusian leader paid his first visit to Islamabad in May 2015. Only three months later, in August 2015, he welcomed Sharif in Minsk for a return visit. In November of the same year, Belarusian Prime Minister Andrei Kobyakov visited Pakistan. In April 2016, Lukashenka met with Mamnoon Hussain, Pakistan’s ceremonial President, on the sidelines of the summit of the Organisation of Islamic Cooperation in Istanbul. In October 2016, the Belarusian president returned to Islamabad for talks with the Pakistani Prime Minister. On top of the encounter in Beijing between Lukashenka and Sharif, the two countries had already exchanged visits of parliamentary delegations in 2017. Against the backdrop of dynamic rapprochement between Belarus and Pakistan, Minsk’s relations with New Delhi have clearly stagnated. In fact, India’s ceremonial President Pranab Mukherjee visited Belarus in June 2015. However, this meeting was agreed upon before the start of Minsk’s energetic engagement with Islamabad. Since then, no high-level intergovernmental contacts between Belarus and India have been recorded. In 2015-2016, Belarus and Pakistan managed to sign over fifty bilateral documents. Most of them are interagency agreements and memorandums of understanding of various importance regulating cooperation in trade, defence, culture, education, information, scientific cooperation, information technology, forestry, and agriculture. They have also adopted a programme document called ‘Roadmap for fast-track and middle-track economic cooperation between Pakistan and Belarus’. 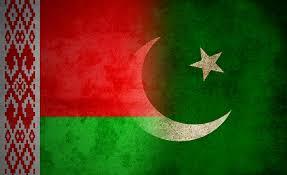 Belarus would like Pakistan to become one of its major trading partners among the Distant Arc countries (Belarusian authorities’ term for all nations outside the EU and the CIS). It is no wonder that the talks between the Belarusian and Pakistani leaders have focused mostly on ways to increase the bilateral trade turnover. On his visit to Pakistan in November 2015, Belarusian Prime Minister Andrei Kobyakov called the existing level of trade turnover (below $60m in 2014) a ‘statistical margin of error’. The two governments agreed on the ambitious goal of $1bn in 2020. Historically, the turnover has surpassed the symbolic threshold of $100m only once, in 2009, well before the much-touted governmental intervention. Since the two countries’ dynamic rapprochement began in 2015, it shows no signs of leaving this ‘statistical margin of error’. Given economic realities, the goal of $1bn turnover looks like a pipe dream. Belarus exports tractors and tractor parts, tyres, synthetic filament tow, potash fertilisers, food products, and other machinery and chemical products to Pakistan. Imports include rice, fruit and vegetables, leather goods, and textiles. Tractors constitute the lion’s share of Belarusian exports to Pakistan: 64% of total export revenue. In 2016, the sales of Belarusian tractors to Pakistan reversed the steady downward trend which had started in 2012, amounting to $32.1m (3,406 units). In 2015, Belarus Tractor Works also opened a knockdown assembly factory in Karachi and manufactured its first few hundred tractors in Pakistan. It seemed that a lingering campaign of mutual accusations of fraud and corruption among dealers of Belarusian tractors in Pakistan have failed to damage sales. Since 2013, Pakistan has been the largest buyer of Belarusian tractors outside the CIS. It is now the third largest buyer worldwide after Russia and Ukraine. Belarus has been working intensively with Pakistani defence officials since July 2014, when Pakistan’s Minister for Defence Production Rana Tanveer Hussain visited Minsk. The two countries signed an intergovernmental agreement on military technical cooperation in Islamabad in 2015. 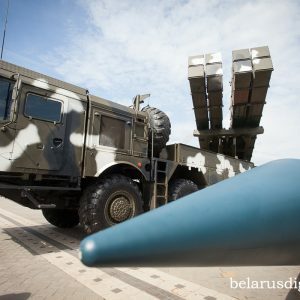 On 21-22 May, Minister Hussain was again in Minsk for the Eighth International Arms and Military Equipment Machinery Exhibition. He met with his counterpart, Chairman of the State Military Industrial Committee Siarhiej Huruliou and Minister of Defence Andrej Raukou. Few details on these meetings or how this area is developing are available. Official Belarusian media sources have mostly avoided mentioning the military and security component in their coverage of high-level contacts between Belarus and Pakistan. They may be factoring in India’s attitude towards this kind of cooperation. Meanwhile, the Pakistani press have repeatedly reported on the discussion of cooperation in defence and defence production, counter-terrorism and narcotics control. Pakistan is interested in electronic warfare technology and optical and optical-electronic devices. According to Siarhei Bohdan, an associate analyst at the Ostrogorski Centre, Islamabad has also been trying to secure the necessary parts and expertise for comprehensive modernisation of the post-Soviet mechanised armour in Pakistan. Later this year, Prime Minister Sharif will again visit Minsk. New agreements will be signed; brilliant prospects for two countries’ cooperation will be announced. However, the growth rate in bilateral trade will continue to lag very much behind the dynamics of meetings, as the current state of Belarusian products and services on offer is unable to ensure the twenty-fold hike in turnover which Belarus and Pakistan agreed on.